To identify where risk is a real part of the investment deal you will commonly hear an equity firm or VC partner claim, we invest in the people . The decision to invest becomes a decision to assume the correct amount of risk for the projected payoff. However, the overwhelming valuations of risk remain deeply flawed. If management proved they were unable to cope with market place change, the 2 issues directly relate. 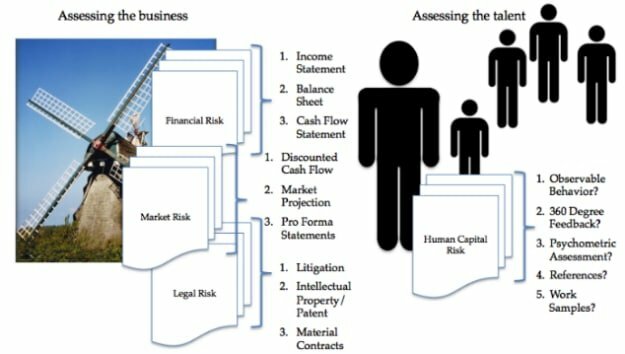 There is no accurate risk assessment without an accurate assessment of human capital. Critically flawed ventures have at least 1 criterion concerning the personality or experience of the leader and the team. 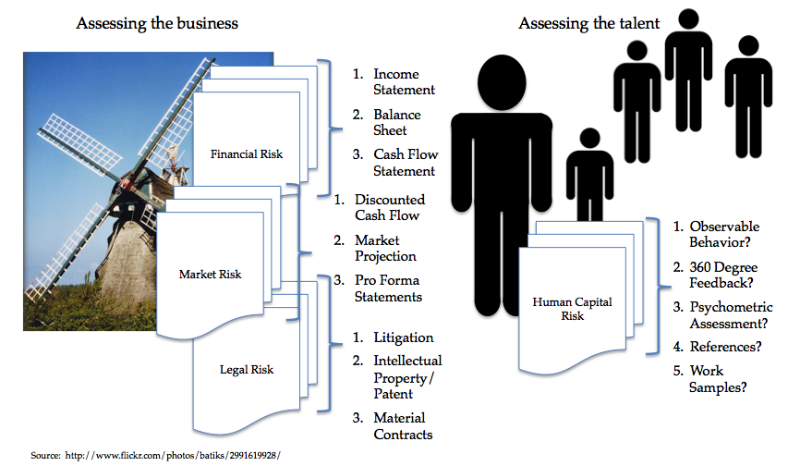 In many evaluations there is a disproportionately low human capital risk assessment compared to financial, market, and legal due diligence. Too often the human capital due diligence focuses on industry experience, work history, and academic education, which has little positive correlation to successful ventures. Relying on observation or documents, reports, stories, and conversations are not quantifiable, non-relatable, and subjective as a true human capital assessment. Technical skill does not mitigate risk. Only quantitative approaches provide comparative analysis. Human capital quantitative results are not an IQ measure. Various studies estimate IQ accounts as little as 4% to 10% to someone’s professional success. An IQ score does not infer job success or mitigate risk. Research in over 200 organizations worldwide suggests the difference between top performers to average performers finds only 33% of the performance is attributable to cognitive (IQ) and technical ability and 66% to human capital competency. How can you have an accurate measure of risk without an accurate measure of behavioral competency. Why would or should someone trust their money is wisely invested when so much comes down to a bet on a leader and a team to deliver?